Medinet Habu lies south of the Valley of the Kings, on the west bank of the Nile across from Luxor (map). The complex contains the palace and mortuary temple of Ramesses III (1186-1155 BC), the last great warrior pharaoh of Egypt, plus an earlier temple to Amun that Ramesses appropriated so that he could be "united with eternity in the estate of Amun." 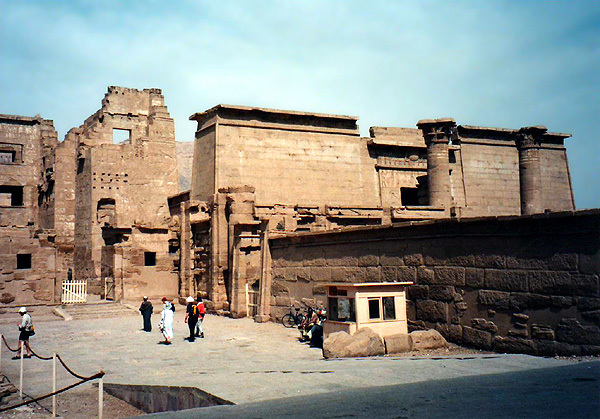 In this photo, the Amun temple (with Roman additions) is seen to the right. Photo left is something not often seen in Egypt, a fortified entrance tower (migdol) built by Ramesses after a Syrian prototype. Ramesses III is celebrated for crushing an invasion of the Sea Peoples, for his victorious campaigns against invaders from Libya, and for numerous building programs. The Sea Peoples were an especially dangerous threat. A powerful confederation of uncertain origin, from somewhere in the Mediterranean or Near East, they are identified in the Harris Papyrus as Philistines, Sicilians, and other peoples whose identity is less certain. In the 12th century BC they erupted in a mass migration by land and by sea, overrunning the empire of the Hittites in the Near East. 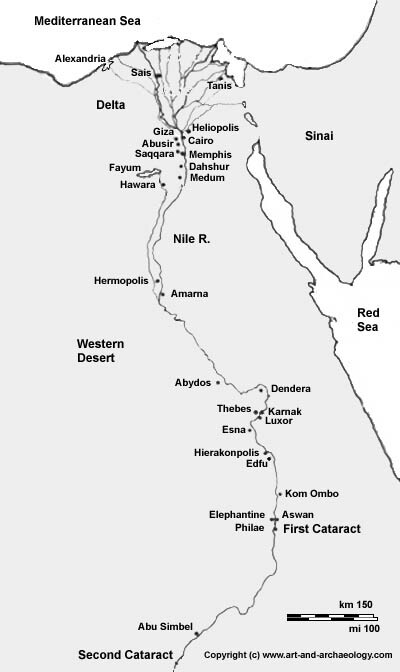 After Ramesses stopped them in the Nile delta, they disappeared from history as mysteriously as they came. Ramesses lived in Medinet Habu, in between campaigns, for thirty years until he was assassinated in the notorious Harem Conspiracy. The conspirators did not escape punishment, but it was too late for this great pharaoh, who was buried nearby in the Valley of the Kings.